Four days of non-stop torrential downpours across parts of North Carolina shattered rainfall records and swelled many rivers. Hurricane Florence made landfall on September 14. Officials with the North Carolina Department of Public Safety say 16 rivers rose above their flood stages by September 18, many of them to major flood levels. Several trillion gallons of rain fell during the storm, according to the National Weather Service in Raleigh. NASA was able to spot darkened, contaminated rivers flowing into the Atlantic Ocean. 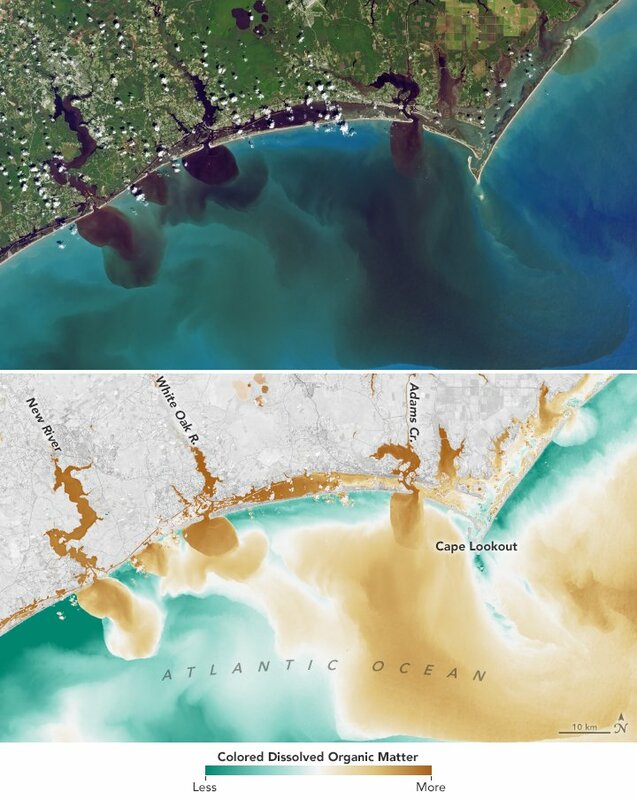 One image, taken on September 19, shows that “soils, sediments, decaying leaves, pollution, and other debris have discolored the water in the swollen rivers, bays, estuaries, and the nearshore ocean”, according to NASA. The discoloration is seen as navy blue and black tributaries spilling from the coast. A second image from NASA’s Landsat 8 used visible and infrared imagery together to show the high concentrations of “colored dissolved organic matter” (CDOM) in the waters. CDOM includes loose materials like leaves, roots, and bark. Rivers also poured into industrial facilities like coal ash dumps and hog farm manure pits, adding to the biohazards..
Keith Acree, with North Carolina Emergency Management, tells FreightWaves that crews have switched from rescue mode to recovery mode now that waters are slowly receding. They’re bringing food and supplies into affected areas, and they’re clearing debris off streets. Local and county governments have been performing mosquito control and sending public messages regarding safety during clean up. He urges people, as they come back, to be very careful as they sift through their homes and properties. Don’t let flood waters, or anything damaged by flood waters, come in contact with your skin. Wear as much long-sleeve protective gear as possible, as well as gloves, hard hats, dust masks, and goggles. If you get cut, clean the wound immediately to avoid infection from bacteria and chemicals in polluted waters. Acree says one or two people have already died this way. Additional safety tips can be found here. Final steps are being planned for various agencies to clean the coastal waterways. This would involve clearing sunken, damaged boats that might be leaking fuel, and clearing containers and other items.